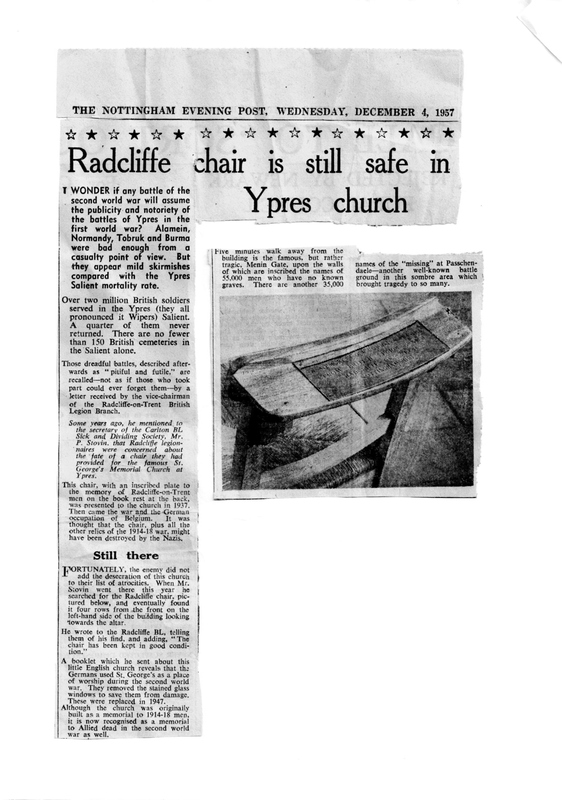 Whilst researching for the Radcliffe on Trent WW1 exhibition that was held in 2014 I came across a newspaper cutting relating to a memorial chair located in the St George’s Church in Ypres. 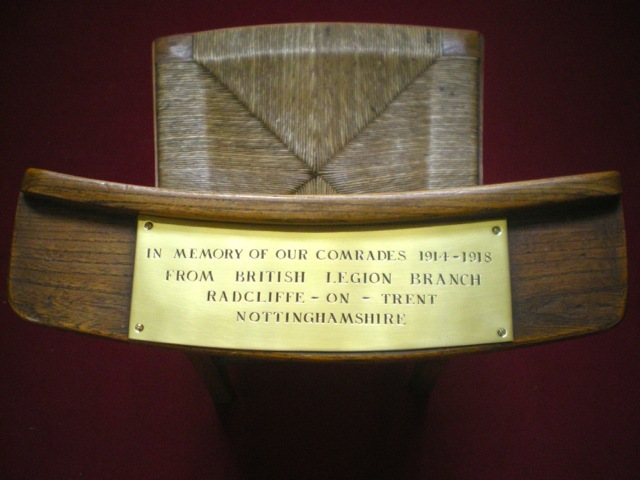 The chair was presented to the church in 1937 and its inscription reads ‘In Memory of our Comrades 1914–1918 from British Legion Branch, Radcliffe on Trent, Nottinghamshire’. I decided to investigate further and also to find out if the chair was still there. Contact was made with the churchwarden who replied saying that the chair was indeed still in the church. The newspaper cutting (see below) stated that a query had been made by the vice chairman of the Radcliffe on Trent branch of the British Legion some time ago. He had written to the secretary of the Carlton British Legion Sick & Dividing Society, Mr P Stovin, stating that the Radcliffe members were concerned about the fate of the chair they had provided for the famous St George’s Memorial church at Ypres. It was felt that perhaps during the Second World War the chair and other relics of the Great War might have been destroyed by the Nazis. The branch was informed it was still there and when Mr Stovin visited the church in 1957 he found it, four rows from the front on the left-hand side of the building looking towards the alter. During the course of the First World War over half a million British and Commonwealth servicemen lost their lives while serving on the Ypres Salient. Fifty divisions were present during the Battle of Passchendaele in 1917, comprising between 500,000 – 750,000 men. After the end of the war Field Marshall French appealed for an Anglican church to be built in Ypres, as a permanent memorial to the dead but also as a meeting place for the relatives of the fallen who were beginning to visit the area. The Imperial War Graves Commission began the search for a suitable place. A piece of land was agreed on the north western corner of the square named Vandenpeerboomplein, not far from St Martin’s cathedral. The architect was Sir Reginald Blomfield who had also designed the nearby Menin Gate. The foundation stone was laid by Field Marshall Lord Plumer in 1927. The design was simple but elegant and was to be in keeping with the surrounding buildings. Inside was also very simple with room for about 200 people. On 24 March 1929 the Bishop of Fulham dedicated the completed church and it opened for worship. A small school was also built mainly to educate the children of the employees of the Imperial War Graves Commission but this closed during the Second World War and is now used as a church hall. The items in the church, including plaques, chairs, windows and banners are all in memory of someone or of a regiment who gave their lives in the battles around the area of Ypres. It is a ‘living’ church, serving the needs of a local congregation as well as many thousands of visitors. It is now a Belgian National Monument. After the Second World War the church received funds for its running costs from the British Legion with the Chaplain being partly paid by the Imperial War Graves Commission. However, funds ran out for the completion of the church itself and the bell tower has stood empty since 1927. 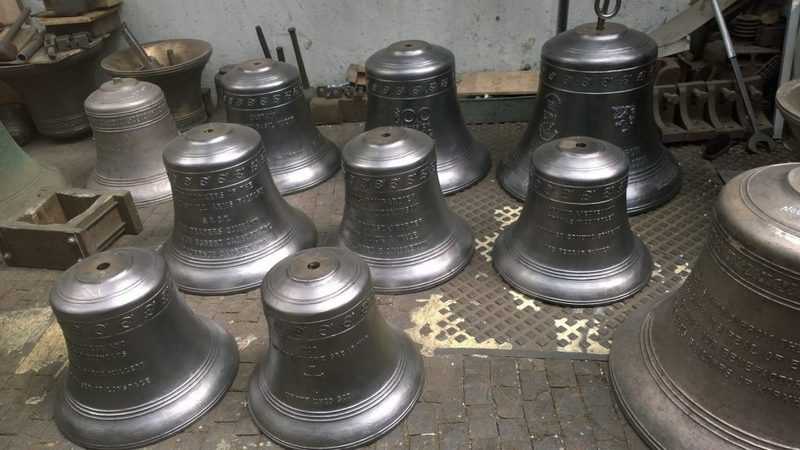 On 22nd August 2017 new bells made in Loughborough, near Radcliffe on Trent, left for Ypres and after installation in the church will ring out for the first time on 22nd October.